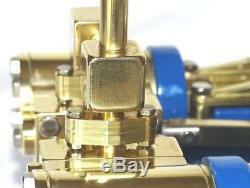 Fully Machined Kit in Brass, Bronze & Steel. For more information, to discuss requirements and our best prices please feel free to call Simon at Chiltern Model Steam on 07941800103. The horizontal twin cylinder Tandem "mill" engine is two single cylinder mill engines connected via a large fly wheel on a steel plate and inlet manifolds, tee and elbow connectors. As such it is still relatively simple and retains the basic mechanics of engines which powered mills and workshops and which needed the extra power provided by a twin cylinder engine. NOTE: Pictures are of the finished, assembled and painted model, this listing is for the kit of parts, see picture - NO BOILER. 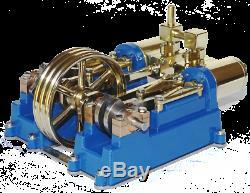 This mill engine layout has two double acting cylinders, eccentric driven slide valves and the large brass flywheel offers smooth running and is capable of powering a range of accessories, in a variety of roles. The engine also includes twin split bronze pedestal bearings for each of the two crank shafts, two cast bases and a steel base plate. The cranks for each cylinder are offset by 90° which means the engine will self-start in any position. The kit consists of precision produced parts each carefully made and checked to ensure ease of assembly and reliability in service. The cylinder assembly and piston are manufactured from brass and the piston shafts, connecting rods and valves from stainless steel so are not susceptible to the corrosion. The piston shafts passes through adjustable glands and the steam inlet can be on the top or bottom, left or right hand sides of the chests. Connections: 1/4 x 40 tpi ME. The kit consists of a set of fully machined parts that can easily be assembled using simple tools such as a screw driver, small spanner, allen keys, pliers and metal file. The parts are mainly unfinished metal and will also require painting, polishing, filing, etc. To achieve the appearance shown in the pictures. For the Assembly Instructions please see. For the Assembly Drawing and Parts List please see. NOTE: The kit is supplied with hex head screws (as per the pictures) but socket or slot head screws are available on request. When assembled the engine is fully working and can be run using steam or simply using compressed air e. From hand or foot pumps. 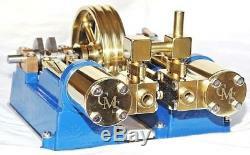 The item "Live Steam Twin Cylinder Tandem Mill Model Steam Engine Fully Machined Metal Kit" is in sale since Tuesday, January 22, 2019. This item is in the category "Toys & Games\Steam". The seller is "rowley1234" and is located in Rugeley. This item can be shipped to United Kingdom, Austria, Belgium, Bulgaria, Croatia, Cyprus, Czech republic, Denmark, Estonia, Finland, France, Germany, Greece, Hungary, Ireland, Italy, Latvia, Lithuania, Luxembourg, Malta, Netherlands, Poland, Portugal, Romania, Slovakia, Slovenia, Spain, Sweden, Australia, United States, Canada, Brazil, Japan, New Zealand, China, Israel, Hong Kong, Norway, Indonesia, Malaysia, Mexico, Singapore, South Korea, Switzerland, Taiwan, Thailand, Chile.